Ah, so if it isn’t enough work for you to keep your driveway and sidewalks clear, now you want to shovel your roof? Besides the obvious dangers of falling off the roof and causing roof damage, shoveling roof eaves is a difficult and temporary fix. Remember, ice dams begin forming where the meltwater exits the snow (See Myth #1). As long as there is any snow up the roof, the meltwater can re-freeze at the snow line and form ice dams even over the heated area. Ice dams re-occur overnight, and they can leak as many roofs may not have an ice dam membrane up to that point. We understand there are emergency situations when there are excessive snow loads and ice dams are leaking. When an emergency dictates, snow and ice removal must be done to prevent structural damage and futher ice dam leaks. Our suggestion is to hire a pro to do the work, someone licensed and insured. 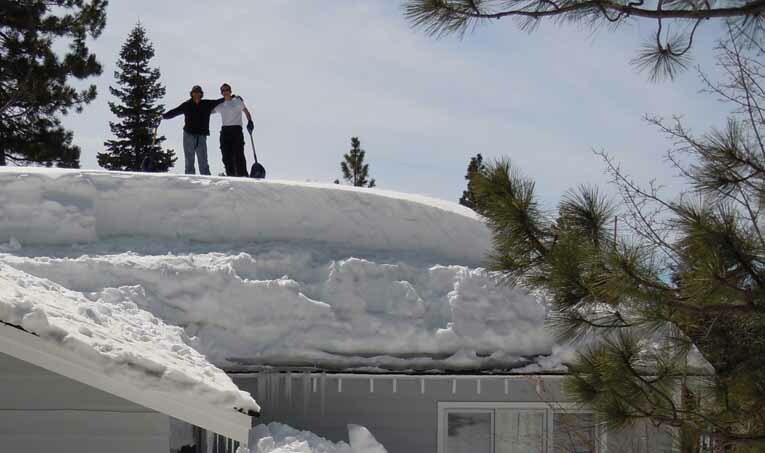 Keep roof shoveling as your last-ditch effort. You might have to do it all over again next week. Choose the permanent solution to your ice dam problems: the Radiant Edge roof ice melt system.